Acne is a very common condition that causes blocked pores, pimples, cysts and other lesions on the skin of the face, neck, chest, back, shoulders and upper arms. Acne affects over 17 million people in the US, making it the most common skin disease in the country. This highly visible disease can cause embarrassment, self-consciousness, and social withdrawal. Teenagers are not the only people who suffer from acne. We commonly see adults in their 30’s and 40’s who still suffer from acne. A significant number of women in their late 20’s and early 30’s develop a “hormonal” type of acne with deep cysts and nodules on the lower part of the face and jawline. Unfortunately, there is no age limit for this potentially disfiguring disease. Acne develops on the skin when the pores become clogged, which may occur as a result of an overproduction of oil, a buildup of bacteria or shedding of dead skin cells that irritate the pores and hair follicles. When these substances build up in the hair follicle, they form a soft plug that forces the follicle wall to bulge and protrude from the skin, causing a lesion to develop. The cause of excess oil production is unknown, but is believed to be caused by a combination of several factors, including hormones, bacteria, heredity and certain medications. Contrary to popular belief, chocolate or other foods and dirt do not cause acne. Acne most commonly appear on the face, neck, shoulders, back or chest, although they can appear anywhere on the skin. These symptoms can come and go, and may flare up at certain times as a result of hormonal or environmental triggers such as pregnancy, menstrual periods, greasy cosmetic or hair products, high levels of humidity or certain medications. 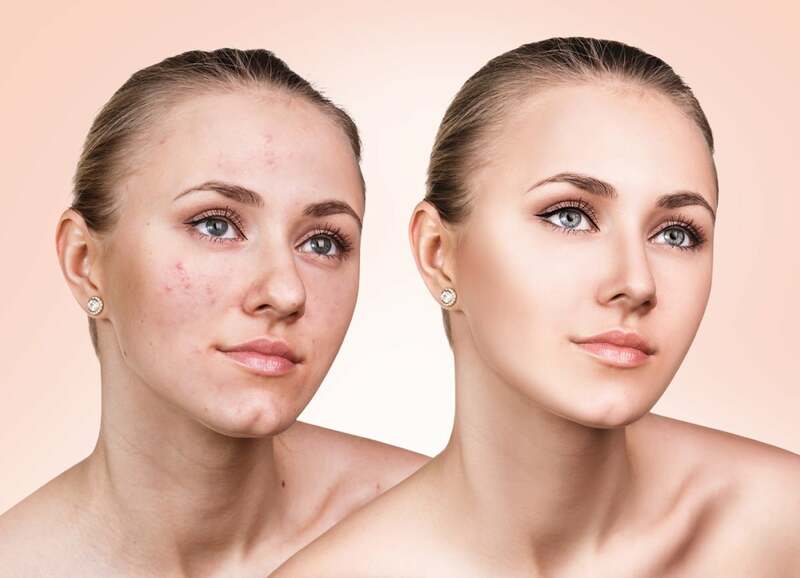 Although acne does not usually lead to any serious health conditions, it can cause permanent scarring and damaging emotional effects for patients of any age. Patients should seek dermatologic treatment for acne if symptoms do not respond to over-the-counter treatment methods or scarring develops as the acne clears. While mild cases of acne may respond to over-the-counter treatments containing benzoyl peroxide or salicylic acid, more severe cases may require prescription medications. At PD&CC, we take all acne cases seriously. At both of our Seattle & Renton locations, we are dedicated to treating acne and preventing acne scar formation. We may recommend a combination of topical medications and oral medications including oral antibiotics, birth control pills, spironolactone, or in extreme cases, Accutane. Some patients may also benefit from chemical peels, laser treatment, or photodynamic therapy. Our providers are all registered prescribers of Accutane through the I-Pledge system. At PD&CC, we take a tailored approach to treating acne. It’s important to know that acne cannot be cured overnight. It may take many weeks before it starts to respond to treatment. Be patient. We will help you find the best treatment plan. Most people with acne are treated with varying combinations of the following products. Acne treatments work by preventing new acne and take time to work. If acne hasn't improved in about 6 weeks, changes to your treatment plan may be needed. What should I expect after acne treatment? At PD&CC, we basically offer every effective form of acne treatment available today. So, treatment expectations and timeframes are variable depending on your treatment. Our goal is to improve your acne by a minimum of 60 to 70 percent in three to four months. But patience is key; it takes time and persistence with our in-office care and what you need to do at home. We generally expect to begin seeing changes in six weeks, and possibly change treatment approaches then if we’re not satisfied with your results. Sometimes, however, the patient’s acne can actually seem to worsen before it improves. This is normal, as lesions can become more inflamed before they start to clear up. It’s important to use the various acne medications we prescribe on all of your acne areas; don’t spot treat small locations with a breakout. Consistency and persistence is key. You also need to resist picking or popping any of your lesions, as that can cause scarring. After you’ve turned the corner, we may change prescriptions or medications. Although your acne is now under control, it’s important to keep it that way. Follow our instructions for ongoing care to keep your face looking great! Ongoing treatments such as chemical peels can be very effective in keeping acne under control. Once your acne is clear, we can then help you with any residual acne scarring or hyperpigmentation. PD&CC has had tremendous success with treating acne scars using the Fraxel laser, which is safe for all skin types. We also have the Active FX/Deep FX fractionated CO2 laser which is effective for more severe acne scars. For hyperpigmentation, we offer a number of chemical peels, including the Vitalize peel containing prescription strength Retinol and the brand new high-potency Melanage peel, containing high-potency hydroquinone for bleaching as well as high potency Vitamin A serum to enhance bleach penetration and exfoliation. PD&CC also carries the Obagi skin care system that contains prescription strength bleaching cream and Retin-A. >> To learn more about our acne treatments, please call our Seattle or Renton office at 206-859-5777 or click here to submit an online inquiry.